Proper specification of bar gratings includes a determination of load conditions, effective unsupported clear span, flooring surface, trim and finish. Appropriate consideration of these elements plus any features unique to their particular application will allow the specifying authority to select products that will provide years of continuing service. In grating nomenclature, span serves a dual role in defining two significant features. First, unsupported span indicates the clear distance between effective points of support for the grating. 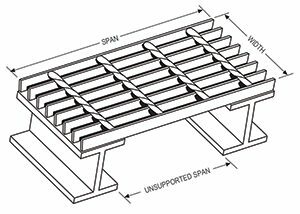 Once the specifier has established the design load and acceptable deflection criteria, grating selection will be dictated by determining the maximum unsupported span and consulting the load tables on the pages that follow. Secondly, span indicates the overall finished length of the grating panels (parallel to the bearing bars) as they are supplied to the customer. The overall dimension of the grating panel measured perpendicular to the bearing bar span is designated as the panel width. 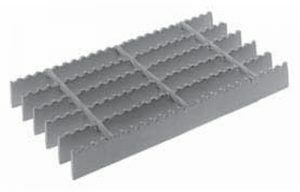 Commonly manufactured and stocked in 24” and 36” nominal widths, grating panels can easily be supplied in a variety of widths to suit the needs of any application. Additionally, custom widths can be shop fabricated to hold any specific tolerance. 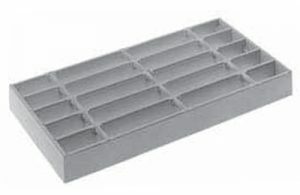 The excellent drainage and self-cleaning characteristics of plain surface grating make it suitable for the majority of applications. In the presence of materials which could cause the top surface of the bars to become slippery, the optional serrated surface should be considered. When serrated surfaces are specified, the bearing bar depth must be increased 1/4” greater than the sizes shown in the load tables and selection guides to provide the equivalent strength of non-serrated bars. To enhance architectural appearance or to provide additional transverse stiffness, the open ends of the grating panels can be banded. This is achieved by welding a flatbar, similar in size to the bearing bars, to the cut ends of the grating panel. 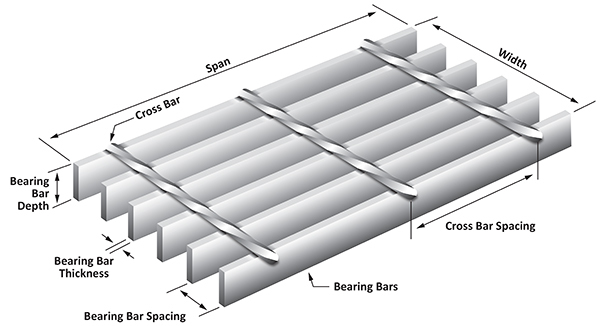 Banding can reduce impact stresses by transferring loads to adjacent bars that are not directly subjected to service loads. Trim banding should always be considered when the grating panels are designed to be removable on even an infrequent basis. Additionally, banding should always be specified when the ends of the bearing bars are unsupported or the grating is designed to service vehicular loads. Further banding descriptions and welding standards can be found on our website. Steel grating products are usually shipped with one of three standard finishes, bare steel, painted with one coat of the manufacturers red or black paint, or hot dip galvanized after fabrication in accordance with ASTM Standard A-123. Aluminum products are commonly supplied as mill finished, but are also available with optional anodized finishes. Stainless steel products as produced typically require secondary finishing such as chemical cleaning, abrasive blasting or electropolishing. All of our grating products can additionally be supplied with specialty custom finishes such as enamel or epoxy coatings. When considering such finishes, careful evaluation of the specified material and consultation with the coating manufacturer is essential.